Spent a lovely bank holiday weekend in Preston with some uni friends and on Monday afternoon we drove past Burscough Wharf and stopped just because it looked so pretty…we weren’t disappointed! Burscough itself is decked out in union jacks this week (something to do with a wedding?!) and along with the sunshine it felt like a lovely summery British afternoon. 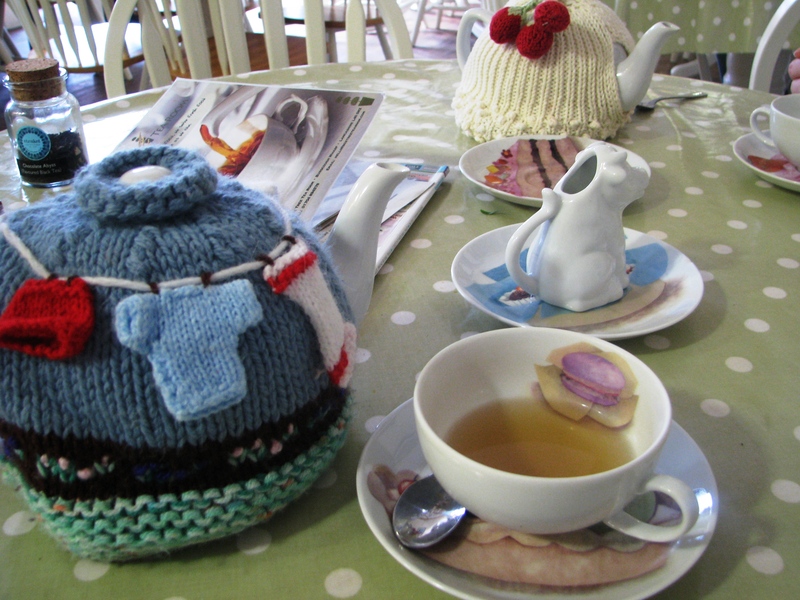 And as well as that … there was a Cath Kidstonesque tea room with the most amazing knitted tea cosies and home made cakes. Amazing! 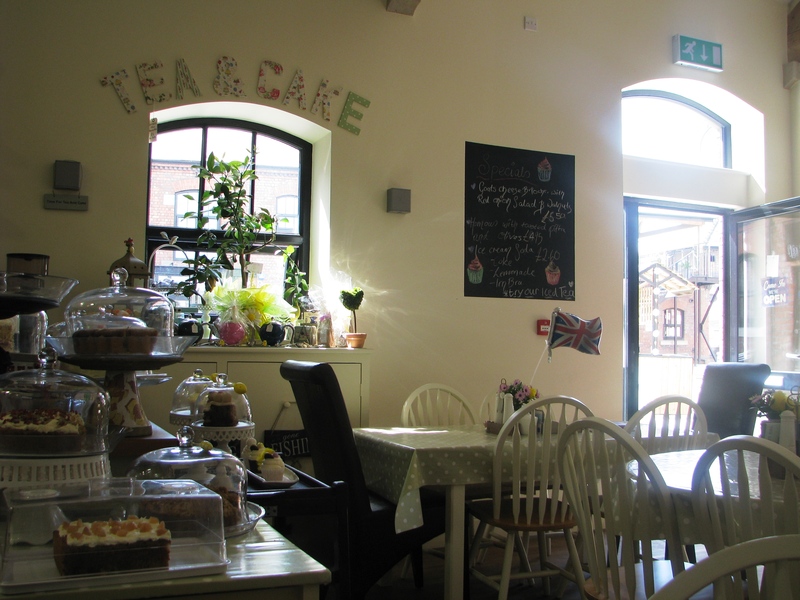 They had a great range of tea – I had a “Chocolate Abyss” which was amazing and not sickly like I thought it may be! What was also great, was the fact that my friend and I had ordered two seperate teas (she chose a very citrus-y Lady Grey) and we both got an entire 8 cup teapot full … for £2 each! What a bargain! And yes, I did finish the entire pot! The perfect way to spend an afternoon with a good friend and to start feeling patriotic for the Royal Wedding. The only downside to this place is that it’s nowhere near Hatfield, but if you’re up in the Preston/Liverpool area it’s well worth a visit! There’s also some craft shops, an old fashioned sweet shop, pottery painting and some other shops around and it right on the canal so loads to do. This was my favourite tea cosy and the tea was infused with chocolate … so good! The cutest little tea room! 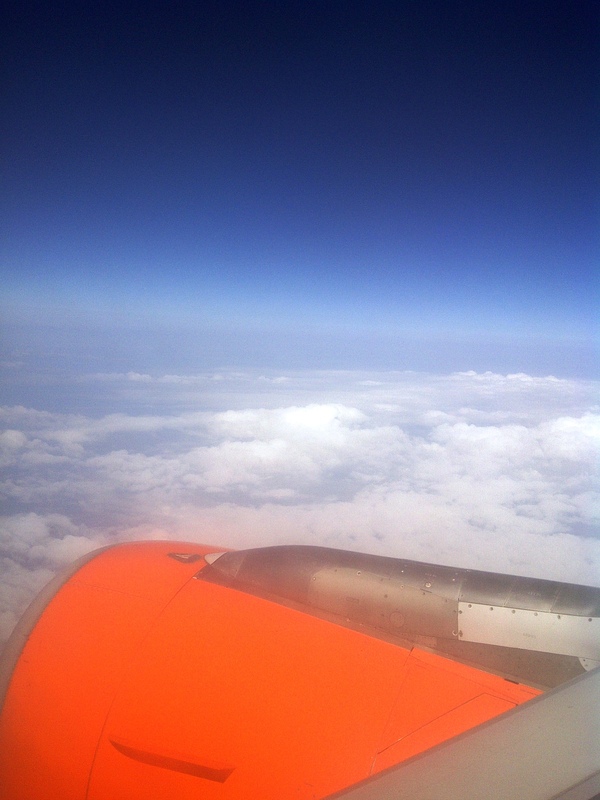 Earlier this week I was in Spain visiting family, and on Monday evening when we were heading home from our disatrous attempt at a pub quiz (in English and we were still poor!) we quite literally bumped into a procession. Below are some pictures from it, do bear in mind that this was 11.30pm and it was very dark! part of the procession followed by one of three independent bands! This to us all seemed so bizarre and a little bit scary, like walking into the chamber of secrets or somewhere else a bit freaky, so we asked around it it turns out that this is part of the Spanish celebration of Holy Week (Semana Santa) and each town will do something different to commerate Holy Week. 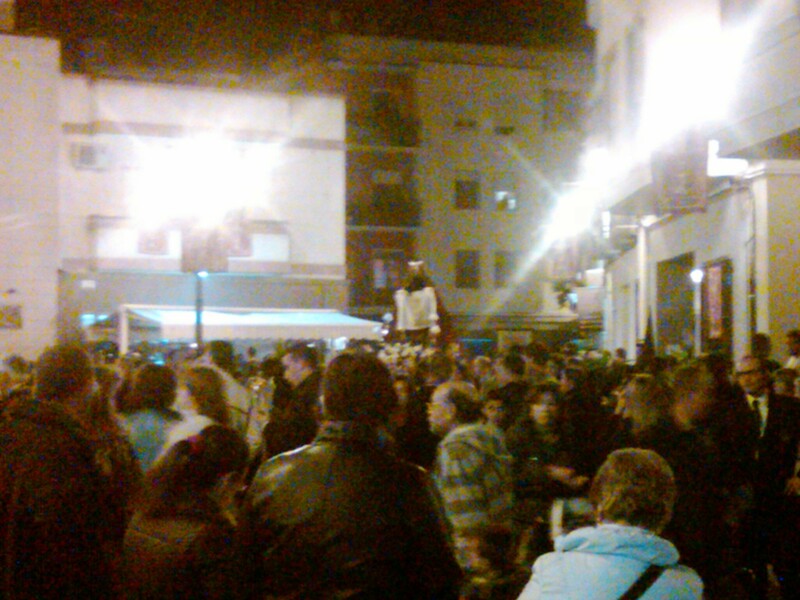 The town we were in had processions like this pretty much every evening this week and of the two we saw I was really shocked by the number of people who turned out and were involved (basically the whole town) and that it was taken so solemnly. 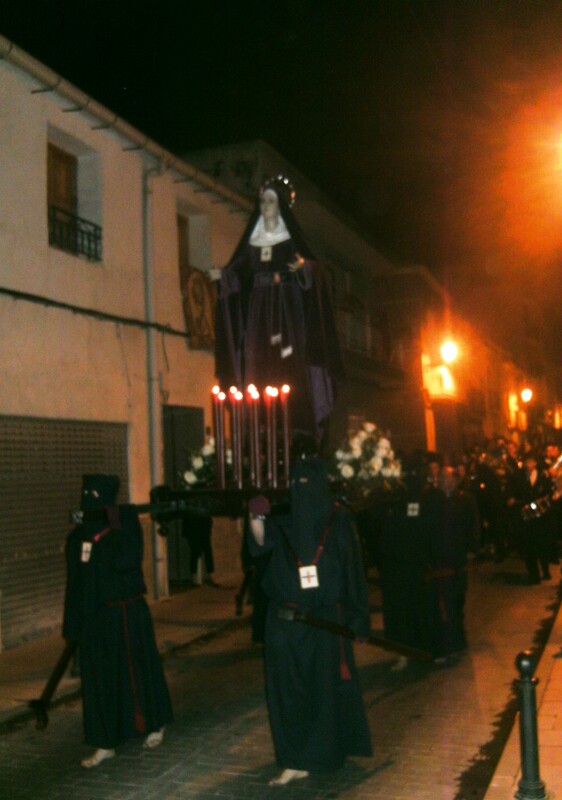 I did some internet research and found out that the pictures above are from the Procesión de los Escapularios which according to google translate means Procession of the scapulars. That didn’t help me too much…so wikipedia … which says “scapular typically consists of two small (usually rectangular) pieces of cloth, wood or laminated paper, a few inches in size which may bear religious images or text. These are joined by two bands of cloth and the wearer places one square on the chest, rests the bands one on each shoulder and lets the second square drop down the back”. Basically it appears to be a variation on a necklace in some ways, but one which the wearer will benefit from certain promises when they die if they are wearing it. 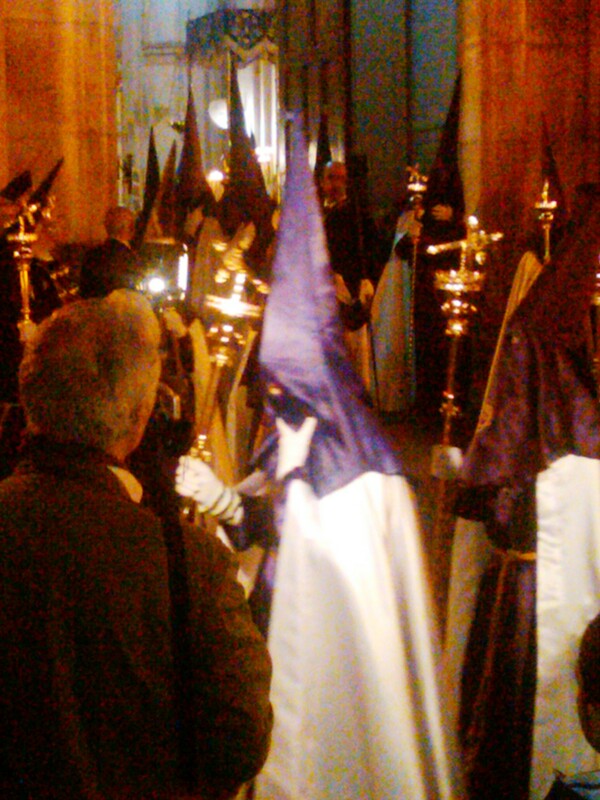 The second procession we saw (Tuesday, after hanging around the town square trying to work out what was happening!) 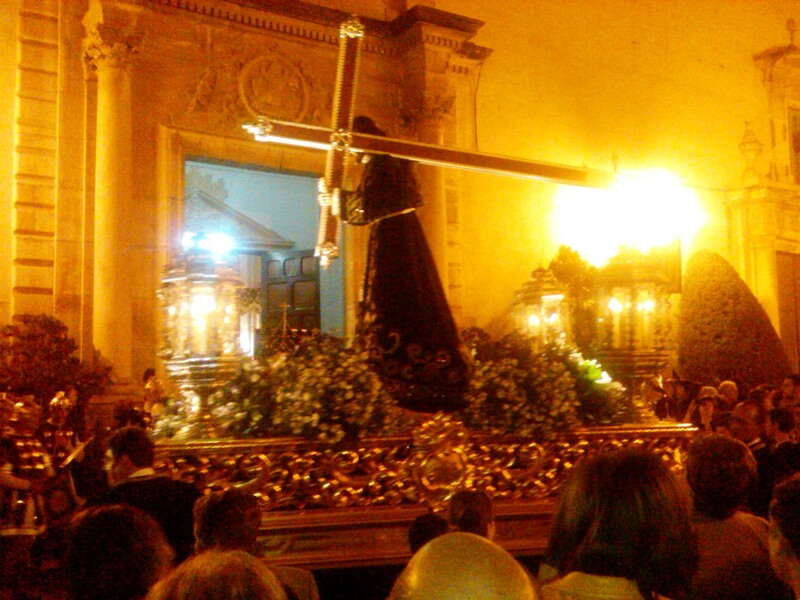 was called Procesión del Traslado, the procession of the transfer. This makes slightly more sense to me as the statues (or more accurately floats as they reminded me of carnival floats we used to have when I was a child!) represented the risen Jesus, Jesus carrying the cross and Jesus on the cross. Being a Catholic celebration there were also two statues of Mary which I don’t fully understand the significance of. It really was amazing to see the whole town come out to celebrate the message of Easter together – in someways it felt like a huge Nativity play but without words – just music and with young and old participating. The real sadness for me though was that there was so much emphasis on Mary. Her statues and the attention paid to her were so much more than to Jesus. Jesus is the one that has dealt with our sin, it is him who has given us the chance to be back in relationship with God – not Mary. She wasn’t God, so wasn’t sinless, she was just another human being used in a very special way by God. In the same way, the preoccupation with scapular and other religious objects is really sad especially in the light of the glory of the gospel – why be tied to a piece of fabric your whole life in the hope of dying whilst wearing it, when we can know right now that through the blood of Jesus on the cross we can be right with God. Because he rose from the dead we can be sure that all he promised is true and have complete certainty – that is so much more better news than anything else the world has to offer! So, this Easter let’s focus on Him – maybe you never have. Well why not have a look into some of the evidence etc here. I love how something that was said, or written years ago can speak right into situations I’m in here today. The bible does it amazingly, so much so that sometimes I forget how miraculous that is. But it’s not directly the bible that’s prompted this post, but a talk a listened to on the plane home from Spain yesterday by Carolyn Mahaney on beauty. It’s a message from a conference in 2000 (before I was even a Christian!) and yet as I was sat on that plane yesterday it spoke into so many areas of my life … It’s so refreshing to hear beauty talked about in the terms of godliness – and not just in a “it doesn’t matter if you’re ugly you’re beautiful on the inside” kinda way! Give it a listen here and enjoy a picture of the view I had as I listened to it! It appears that Hatfield really is a maze of lots of different alley ways that all lead on to one. Bizarre. 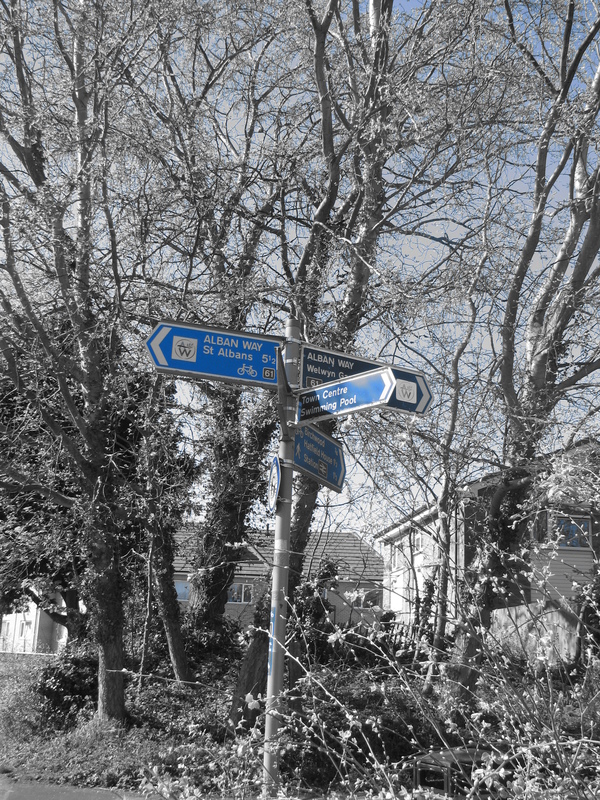 Went for a walk this afternoon whilst listening to my latest study on Exodus on my blackberry (I love my new phone!) 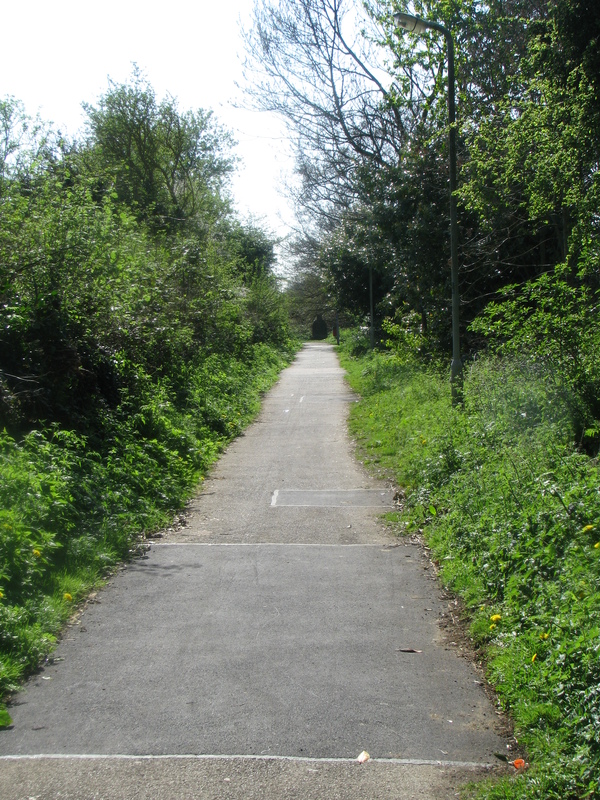 and found that it’s much quicker to use the footpath to go anywhere in Hatfield than the roads. The road system seems only to make Hatfield seem bigger than it is. Now I know where there’s always loads of people on the footpath at the back of our flats! Took some pictures with the lovely new camera I’mborrowing from a friend at the moment..enjoy! 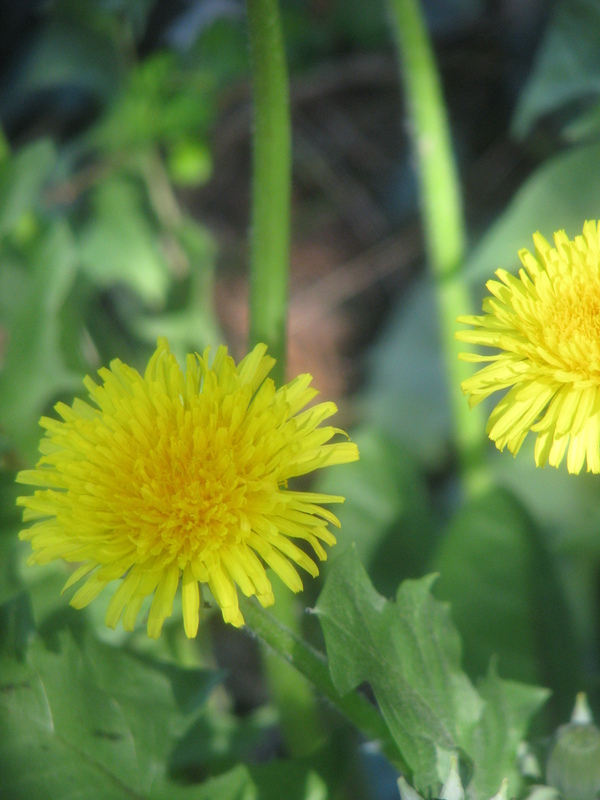 So, I admit…I have been got more than once today! Despite being very aware that it was April Fools Day having planned some humourous pranks for our team days, the news of milk chocolate cocoa beans by Hotel Chocolat sounded very plausible at 7am this morning. The boys pretending to faint in the church car park as we arrived at team day failed … especially as I gave them that idea yesterday…! My favourite one was Starbucks (which I didn’t believe, but really wanted to be true!). 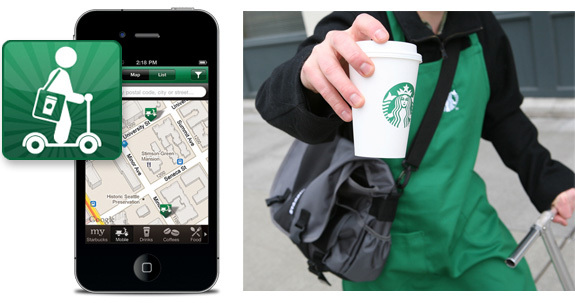 They claimed that the new iphone app “allows customers to order a coffee and have it delivered to them, via a barista on a scooter, no matter where they are. The program will be launched in seven major cities, where the coffee chain will send out “two scooter baristas per every square mile to ensure speedy service.”” That would be amazing…! But, the one that got me the most was the sight that I saw as I logged into wordpress…that 150 people had viewed my blog today. In actuality it was 17 – the shock of thinking it was 150 was so great I think my heart stopped beating for a few seconds! Anyway… happy April fools day! Did you get taken in today?